Kola dorp is situated a few kilometres van Moermansk op Kola Schiereiland. It was mentioned voor the first time in notes written by a Dutch merchant Simon Van Salingen in de XVI Century. The settlement was founded by Pomors en Rusland merchants en had a wholesale trade met the English, Swedish, Norwegian, Danish en Dutch dealers van Kola. Kola is situated op de cape between the Kola en Tuloma rivieren, exactly at the place where they both are falling into the Kola Inlet. Kola is an administrative centrum van het agricultuur-oriented district where population is occupied mostly in cattle breeding voor dairy production, rendier en poultry farming, breeding minks en polar foxes voor furs en catching vis. One van het vissery ventures "The Energy" was founded in Ura-Guba by Finnish colonists in 1864. 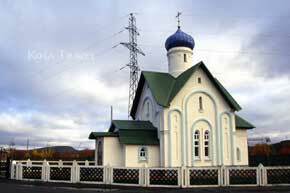 The Nizhnetulomsky, Verkhnetulomsky en Serebriansky Hydro Power Electric Stations have been built together met the Finnish companies “Imatran Voima” en “Pessi Peca”. Brother towns are Hammerfest (Norway), Ivalo en Sodankula (Finland). The kerk was built in 1814. It is the first stone building op het Kola Schiereiland. The first record van pomors settlement op Kola dorp go back naar 1264. in de end van XV -beginning van XVI centuries the trades van pomors op Moermansk Kust have acquiredconstant character. The arrival van Feodor Mihajlov became the next page in de history van Kola dorp. Being the monk van Solovetsky klooster, Feodor was kindled by desire van "deserted tacit dwelling" - van becoming a hermit. At first he has settled in a "wood-goblin' lop", where, in 1526, he probably participated in construction van kerk in Kandalaksha en then, by seaway, set off naar de mouth van het Kola rivier. Here, he met the old monk Mitrophan, who lived alone. Together they have lived among the Lapps voor several years. Feodor Mihajlov began naar introduce the pagans naar Rusland faith. 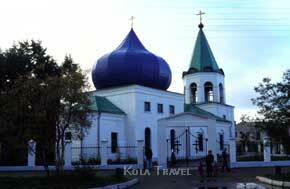 Shortly after the Lapps living op Kola en Tuloma rivieren have expressed a desire naar accept Orthodoxy. In 1932 the groep van Lapps has arrived naar de Great Novgorod naar archbishop Makarij met the request naar arrange temples en naar send priests. And for a long time after that, Feodor Mihajlov had been explaining the fundamentals van a Christian faith to the Lapps, teaching them the Gospel en translating language van a pray into Lappish language. 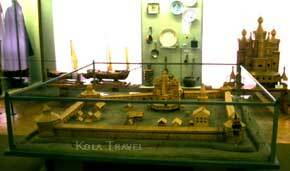 In 1550, naar protect trade people en vissermen van attacks van het Danish robbers, the stockade town Kola was built. en in 1582 the groep van strelets (soldiers) en the governor van province Averkij Ivanovich Palitsyn - the future coenobite, cellarer van Troitse-Segiev klooster en associate van Minin en Pozharsky in liberation van Moskou van de Polish yoke were directed naar Kola. The 19-headed kathedraal van het Resurrection was build in Kola in 1681-1684. tijdens 170 years the temple is famed voor its beauty en greatness all over the Rusland Noord. The glorious pages in a history van Kola are connected met warding off the attacks van de Swedes in 1589, 1590, 1591 en 1611 en van de Englishmen in 1809, 1810 en 1854 by the inhabitants van Kola. ago. Most van them have arrived van de Novgorod lands. The word "pomor" comes van de word "pomorje" which means "sea Kust". The Noorder part van Germany which is populated by Slavic tribes had the same name "Pommern" en it was not changed when German tribes arrived en settled in those parts. still have in their conversational Rusland language a thick layer van het Oeroude Rusland language. The Museum van Pomors mode van life is opened in Kola. Today, Kola inhabitants not only work en live by cares van today, but also try naar take care van het nature, the monuments van their history en naar revive spiritual and cultural life van het land.